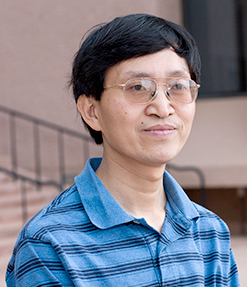 Aixue Hu has been continuously working on the climate change research using CCSM3 in 2009. His recent publication (Hu et al., 2010) highlights the importance of the Bering Straiton global glacial climate. Although this strait is narrow and shallow, the status of this strait is important to the stability of the global climate, as such a closed Bering Strait due to the growth of the land based ice sheets can make the important ocean circulation the Atlantic meridional overturning circulation (MOC, or the thermohaline circulation, THC) become stronger, thus warm the North Atlantic and the surrounding regions, and leading to a retreat of the ice sheets, and producing large sea level oscillations during the first half of the last glacial period. His work on the potential effect of the Greenland Ice Sheet melting has cought significant public attention since this work indicates that the dynamic sea level can rise more in the North Atlantic when the MOC is further weakened by the inflow of the Greenland melt water into the North Atlantic, posting potential threat to the east coast of the United States. He also worked on the decadal prediction reseach, the decadal trend of the Indian Ocean sea level, the change of the North Atlantic subpolar gyre in the 21st century. Hu is a meteorologist and oceanographer who studies the interplay between variables such as climate, ocean circulation, and sea ice. Some of his recent research looks at how Greenland's melting ice sheets are projected to significantly raise sea levels along the northeast coast of North America, with potential impacts for Canadian and northeastern American cities. Hu also studies the Atlantic's meridional overturning circulation, which transports heat from the tropics and moderates the climate of northern Europe. He works in NCAR's Climate and Global Dynamics Division.